Founded in 1812, Laurent Perrier is one of the most popular champagne selling brands across the world. 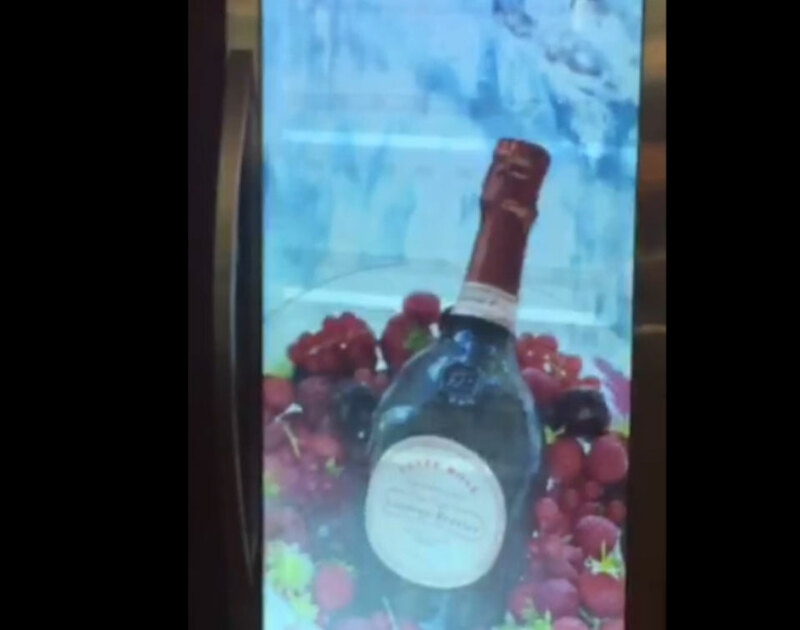 They wanted to further advertise their champagne products through the use of digital fridge screens. These screens allow users to see the products inside the fridge, as well as simultaneously showing an advertisement on the front. As you can see, it’s possible for the fridge screen to be slightly transparent. Laurent Perrier asked AMA to utilise graphics on these screens that were to be featured in the VIP section in Manchester Arena. The main aim was to create an eye catching advertisement to show people as they wait at the bar. First of all we created a storyboard, so that we could get an idea of what we wanted to see based on the client’s brief. We then gathered together the assets needed to create the project. Every asset we used had to be of high quality, and fit the size specs. We made sure to include smooth transitions between each animation, which fit the brand well. As ever with today’s digital needs, screen size comes into play when creating any piece of content, and so one key point was to ensure that all the assets fit the screen well. Once we were happy with our graphic, we tested and re-tested using our in house version of the exact screens being used. This was to make sure that the graphic looked and worked how we wanted it to. By sticking to the brand values, AMA were able to produce an engaging piece of content that the client approved of. Digital screens on objects such as fridges could be the next step in marketing in the future. They are the digital point of sale, and because they can both advertise and show the product at the same time, they’re really taking marketing to the next level. We may be used to seeing cardboard advertisements placed next to the products on shelves and in fridges, but in the near future we could be seeing these fridges in supermarkets. They prove to be more engaging to customers. © 2018 AMA. 30-38 Dock Street, Leeds LS10 1JF. AMA is registered in England and Wales under company number 07353922.